Here is a wonderful novel way to gain a full-body ‘frequency rehab’ tune-up perfect for both self and professional applications. Developed by naturopathic doctor and sound healing Solfeggio frequency pioneer, Dr. Leonard G. Horowitz, these beautiful gemstone disks resonate the seven chakra colors and frequencies. Their subtle yet powerful energies can be felt on the skin as they ‘heat up’ on imbalanced energy centers (i.e., chakras). Place them in the area of the chakra on either side of your body. Their natural gemstone color frequencies are supplemented by the “MIracle” 528Hz frequency radiating from the crystallized matrix made from non-toxic vegetable resin. Dr. Horowitz designed this ‘therapeutic art’ for ease of healing administration. The healing energy naturally radiates from the colored gemstones. The disks conveniently hold these stones where you place them, rather than having the stones roll off during treatment sessions that can last from 20 or 30 minutes to 1 hour. After 30 minutes, assess the pain or condition? It typically feels improved. If you're not sure, repeat the simple treatment. After 1 hour of simply relaxing with the Chakra Disk in place, you will be amazed at the disappearance of the pain, dysfunction, or noticeable improvement. The benefits typically last for several days; and the treatment can be repeated any time without fear of "over-doing it." The stability and safety of the design enables self-applications as frequently as you like. 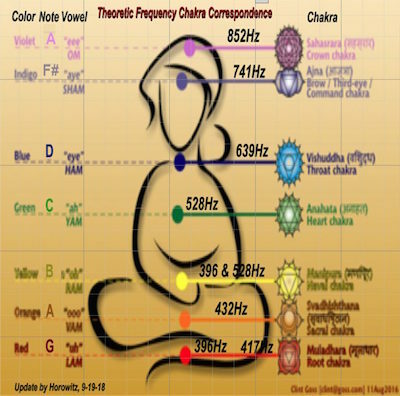 Simply place the Chakra Disks(TM) on or near the body chakra (energy vortex) and ‘zone out’ into a state of bliss. These beautifully supplement the chakra energy healing provided by Dr. Horowitz’s Solfeggio Eclectica music album (sold elsewhere in this tore). That music can be played during this therapeutic session to rehab the energy enlivening the whole person. Each Chakra Disk is is hand-crafted and custom made. The beautiful 'healing stones' are also individually selected. Pre-ordering is required to accommodate the lengthy process and your preference for either the ’standard’ disk gemstone selection (as shown in the photograph); or a ‘deluxe model’ containing more costly hand-picked stones. Chakra Disks subtly vibrate and resonate colored elemental energies that are effectively used to balance each chakra (i.e., energy center in the body). This, in turn, helps balance and 'rehab' the natural flow of energy through your acupuncture energy meridians. Apply these on your skin in bed, on atop cotton garments. You will slowly-but-surely feel them "heating up." The energy is soothing, relaxing, and healing. Back pains miraculously disappear. People who use these report terrific results. The convenient design also allows the recipient to administer self-help. Simply place these on your body yourself. You don't need a therapist to do this for you. Simply relax with these specific colored disks adjacent the correct chakra and experience the benefits. Again, a typical chakra therapy session using this equipment lasts 20-30 minutes. Besides feeling much more relaxed, aches and pains you had before the session will be gone, or much improved. AMAZING! Good News for Handy Folks—These commercially-valuable healing products are not hard to make. If you are a mildly handy, good with your hands, and have an eye for color and form, you can have a blast making these, and even start your own business selling them. To do this, a video instructional has been produced by the pioneering developer, Dr. Horowitz. He supplements the video with detailed text and graphics, and guides you step-by-step to manufacture your own "Chakra Disks." Similar instructions can be used to make beautiful and functional medallions, other crystalline art forms. Learn to make useful frequency-generating products by viewing Dr. Horowitz's training program. 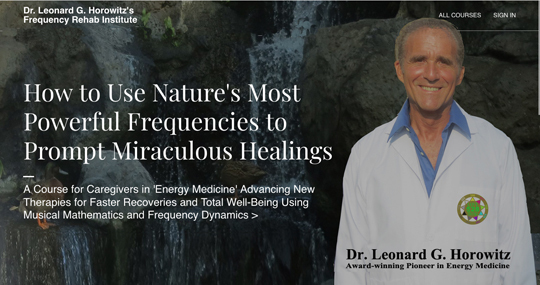 Better yet, enroll in his fantastic 'Frequency Rehab Course' presented online. Check out HealthWorldNews.net for more information. These Chakra Disk sets are hand-made, and custom ordered. Prices range from $150 to $300 each. That's a total of $2,400. You can choose from two different colored 'heart chakra' disks, one is green the other is pink. Custom Order—This hand-made package is not discounted. Prices range from $150 for each ‘standard’ disk (as shown in the photo), to $300 for each ‘deluxe disk.’ The standard set includes seven (7) disks. However, two heart chakra disks are available by request in two colors, green and pink, since both are commonly used by professionals. 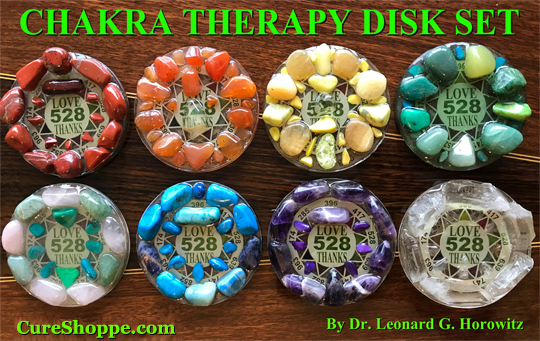 The complete Chakra Therapy Disk Set of 7 discs is custom-ordered for Only $1050 for the standard set, and $2100 for the deluxe set. (Add $150-to-$300 more for the extra Heart Chakra Disk. Shipping is free for Domestic Orders. Format: Seven (or eight) custom made disk set as shown in the photographs below. To Order the Full Chakra Disk Set CLICK HERE. Click the button below to add the Individual Chakra Disk (Standard or Deluxe) to your wish list.